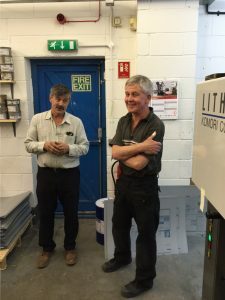 After a very busy start to the year we had a bit of a surprise to find that one of our lead printers had decided that the time was now to consider retirement, this is after a life time in print. Graham thanking Dave with a quick speech with all the team – Dave looking uncomfortable! Dave Dennet has been with us nearly 10 years and in that time presided over some big changes in our press room. Originally starting on our 2 colour Heidelberg, then our 5 Colour Heidelberg 74. A Heidelberg man all his life, Dave didn’t speak to me for days after we decided to invest in the new Komori technology! Once installed and trained he soon became a big fan of what the Komori press could produce. That was 6 years ago, more recently Dave was learning new things again when we installed the first Komori HUV 5 colour press, demonstrating his ability in being up and running in a couple of days! 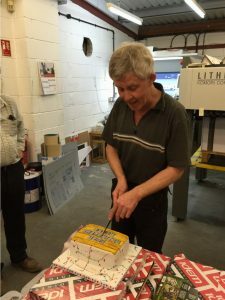 I speak on behalf of everyone in the company when I say Dave will be sorely missed and we are grateful for his invaluable contribution to Remous Print since his arrival.